The Buddha&apos;s vertically raised open right palm personifies fearlessness, divine protection, provides peace and a sense of inner harmony and self-confidence. 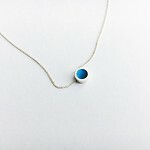 The height of the pendant is 15 mm. A cord is not included in set for the pendant. You can order it with cord stoppers or a chain of desired length in Chains and cords section.